I grow many types of organic heirloom tomatoes each summer. Though I have made and water-bath canned several different kinds of cooked salsas in years past, I decided not to bother this year. I far and away prefer to make and eat fresh salsa (aka Salsa Fresca or Pico de Gallo) with my tomatoes right after I pluck them off the vine. I take a pretty loose approach to salsa making. I don’t really follow a recipe- I simply chop up a slew of tomatoes, then add a little of this and a little of that. Red onion is a must. So is lime juice, cilantro, and some jalapeño chile. Sometimes I may add cucumbers…avocado is another option. In the pictures here, you’ll notice I added fresh (raw) corn sliced right off the cob. 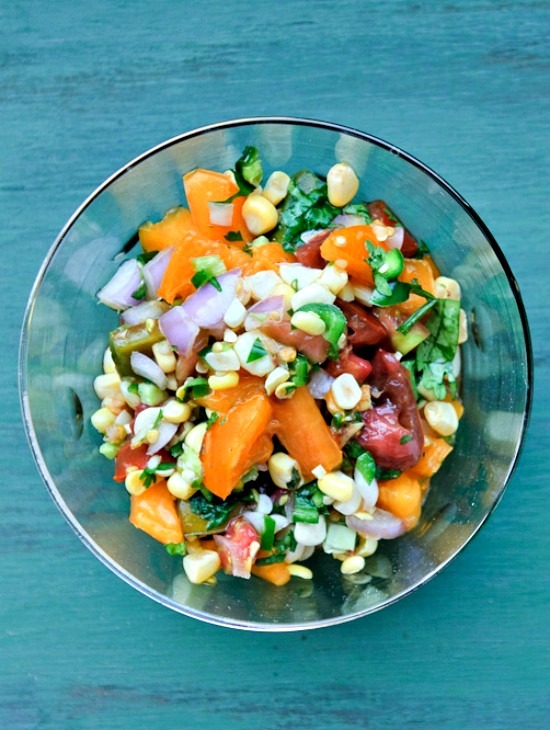 Below is a basic fresh salsa recipe with which you may play around. Chop the tomatoes as big or as small as you like, and use different colored heirloom tomatoes, if possible (though if you want your salsa to contain as little liquid as possible, it’s best to use plum tomatoes). Make a little to snack on with crackers or chips, or to eat with veggies, or throw together a big batch to enjoy with tacos or any Mexican-inspired meal. I’ve been known to eat a big bowl in lieu of a salad! Have fun and enjoy. Some liquid from the tomatoes will accumulate in the bottom of the bowl while the salsa is "resting"...you can drain this before serving, if you like. Use plum tomatoes (you'll need a few more than the recipe calls for because they are smaller) if you want your salsa to contain as little liquid as possible. 1. Mix all the ingredients in a medium bowl. Taste and adjust the ingredients to your liking. Let the salsa "rest" for about 30 minutes, then drain the liquid if quite a bit has accumulated in the bottom of the bowl. 2. Serve immediately, and/or store for 1-2 days in the refrigerator. 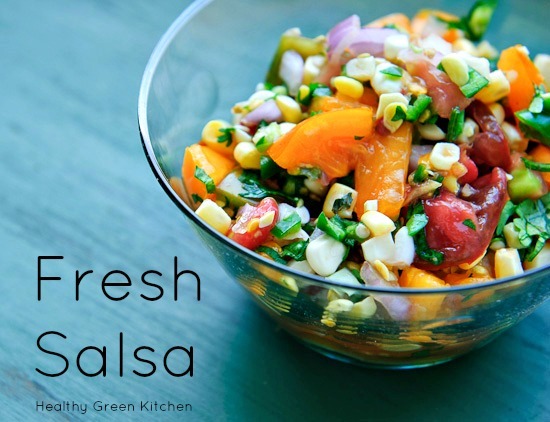 Salsa is a daily snack for me; I could easily eat this entire bowl! Beautiful. I’m pretty loosy goosy with my salsa recipes too. Free form! 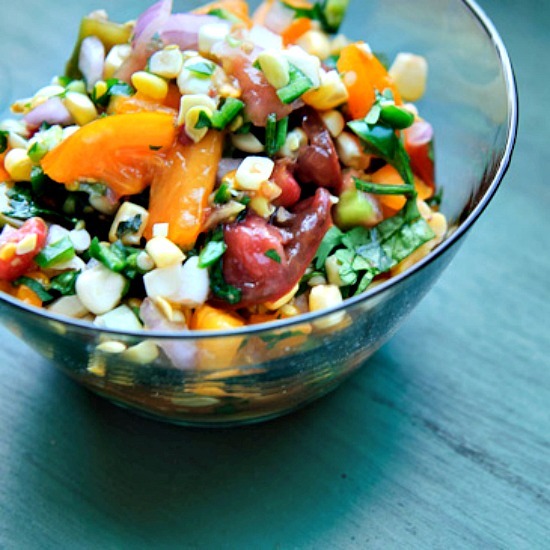 I love the raw corn in this. What a nice pop/crush it would add with just the right amount of sweetness. Yum! Living in the mountains, our tomatoes are just hitting their peak. Fresh tomato anything is on the menu these days! The salsa is gorgeous. The liquid that sits at the bottom of the bowl is my favorite part- great drizzled over lettuce for a quick salad! Created this today! I also added some lime zest for color, taste, and nutrients. I ate with baked clams and grilled queso blanco. I added some crumpled tortilla chips to the salsa plated for me last second for an added crunch. Delicious and I hope I can make it again before summer ends!